Here is a very well done video by Aish.com detailing the recent Photoshopped images and other rediculous altered photos from the media (especially Reuters) concerning the war against Hizbullah. 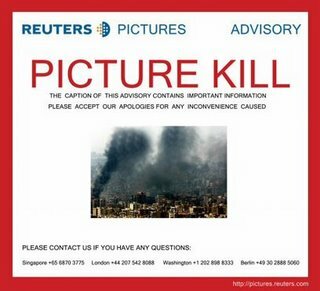 Reuters has actually withdrawn one photograph of a Beirut after Air Force attack after US blogs pointed out blatant evidence of manipulation. Reuters' head of PR says in response, "Reuters has suspended photographer until investigations are completed into changes made to photograph."